iPhone phenomenon is global and is doing well in terms of grabbing the market share from other handsets. 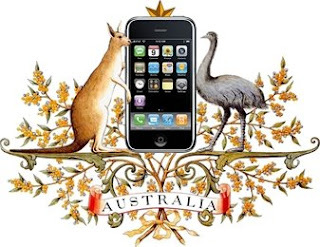 In Australia consumer is crying, even though it’s a hit with general public, courtesy of 3 telco’s, which have got the agreement with Apple, Telstra, Optus & Vodafone. Main reason consumers are crying is because their pricing plans are the most expensive compared to other 21 countries where iPhone 2.0 is launched. Well there are no prizes for guessing that Telstra's plans are the most expensive plans. Most of us havn't been able to understand why Telstra is offering plans which are not suitable for a smart device like iPhone - its not a phone its a mini PC. But now it is becoming clear why this is so. It’s not widely known that Telstra negotiated hard with Apple to allow applications like Whereis (Sensis) to be preloaded in iPhone. This is the usual territory for Telstra, being the dominant player here they get away with most of the times with their wish list, but Apple didn’t relent to their request this time. As a result of this Telstra joined the party later with other 2 Telco’s on July 11 to start offering iPhone. Another vital aspect of Apple’s deal with carriers across the globe has been that they will charge some brokerage ($$) from carriers on the each handset’s plan with them and let the price of handsets to be subsidised upfront at 199 & 299USD for new models. From Telstra's point of view this means less returns & margins on their network. This is not how Telstra has made money in the past. This is probably one of those rare occasions where Telstra had no choice on the negotiating table, but had to agree to what Apple said. That’s why I believe Telstra lost round 1 to Apple's iPhone. Now looking at future, how Telstra will compete as a carrier without compromising on their terms & conditions. Well the answer to that is Google's Android platform. This is where Telstra might be preparing. Main reason for this are threefold. Google’s revenue model is structured around online ads. 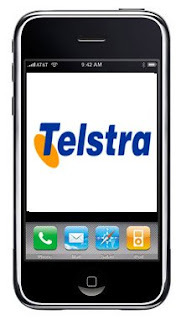 It will be highly unlikely that they will charge any brokerage from the carrier’s like Telstra. This goes well with Telstra and other carriers. As long as ads are served on a mobile platform Goggle will be happy. Secondly, Android is not a walled garden (closed system) unlike iPhone, which has a very stringent control on what applications can be available via Apple Store. Android d oesn’t have any tight control on what applications can be built using its SDK; it’s an open garden. This means Telstra not only will build applications for it but might negotiate with Google to preload its applications like Whereis instead of Google Maps. This open model will be popular but also has the potential to give some grief; Linux distributions can be seen in this context. It will be good to have some less controlled model for Android on the lines of Wikipedia model - publish and filter model. Third unlike iPhone, Android is not tied to iPhone specific hardware; it will be available on most handsets, which is now working on the common specification under the umbrella of Open Handset Alliance (OHA). These 3 compelling reasons make me think that Telstra might be preparing for round 2. Telstra CEO, Sol Trujillo has said 'Google Smoogle' and see's Google as their biggest competitor in the market. Customers would want Google maps rather than Sensis maps so there are at least a few problems here that need to be solved. It will be interesting to see how Telstra will proceed from here what ever happens it won't be easy for them as the business models are all moving towards open platforms. On a media level Telstra will never be able to compete with true media companies. They however believe that is the market they will play in, but they are not used to play in an open market, they can only be successful in markets they can dominate, if it comes to content competition in a free market Telstra will most certainly loose. Back to current fiasco: I will be highly surprised if Telstra will change its plans drastically which consumers want. It looks like 3 & Virgin Mobile will be the best options for iPhone either way. iPhone carriers are in for battle similar to aviation industry is going through. Optus reseller Virgin Mobile is rumored to offer the most consumer friendly plans, to capture the lower end of the market. This is similar to what Qantas & Jetstar Combination is doing, not allowing other players like Virgin Blue to runaway with the market share. And now Singapore airlines with Tiger airways are doing the same thing. It looks like Optus has taken the leaf out of aviation industry. Having said that I won’t be surprised if Telstra will choose the same direction/paths to counter Optus in the immediate future. As a consumer there is still no relief from these opportunistic Telco’s who are busy making money on a global phenomenon without much effort. What do you think as a consumer? What options do we have here in land of Green & Gold? Credit: Thanks to Paul Budde for his comments/observations. When you thank someone for their comments and observations, maybe you should actually quote them or at least show which bits are their comments and observations. Otherwise it looks like cheap name dropping. Thanks for your input. I have now updated it with specific comments from Paul.